A further release from the Church of Uganda has been received. See here for the most recent statement. Also here for an earlier statement. The Church of Uganda does not have oversight of any Anglican churches in the United States. Member churches of the Anglican Church in North America that have been in partnership with the Church of Uganda in the past were not in any way involved in the Church of Uganda’s position on the Anti-Homosexuality Bill. They were not consulted, nor was their support enlisted. The Ugandan context is different from the American context and it is likely that our American friends will have a different position from that of the Church of Uganda. and an article by Clifford Longley reproduced here below the fold, with the express permission of the editor. A summary of Friday’s business at General Synod is online. Inclusive Church welcomes the vote by the Church of England’s General Synod to extend pension rights beyond the legal minimum for civil partners. The motion was carried by a clear majority in the Houses of Bishops, Clergy and Laity. The debate was characterised by a desire to show that the church can act justly and generously in support of those in civil partnerships. Summaries of Thursday’s business at General Synod are online. Note The above items refer to an address by the President and the Vice-President of the Methodist Conference to the General Synod on Thursday morning. The Methodist Church of Great Britain have released this press release. The text of the address is available here. This afternoon General Synod voted in favour of providing pensions to the surviving civil partners of clergy on the same basis as they are paid to surviving spouses. At present, and in accordance with the minimum requirements of the law, service before 5 December 2005 does not count towards the level of pension for surviving civil partners. The private member’s motion, text below, was proposed by the Revd Mark Bratton, and was passed without amendment. That this Synod request the Archbishops’ Council and the Church of England Pensions Board to bring forward changes to the rules governing the clergy pension scheme in order to go beyond the requirements of the Civil Partnership Act 2004 and provide for pension benefits to be paid to the surviving civil partners of deceased clergy on the same basis as they are currently paid to surviving spouses. The vote was taken by houses and all three houses voted in favour; here are the detailed voting figures. That this Synod recognise that it will be some considerable time before surviving civil partners’ pension rights reach parity with those of spouses, and in the light of that note the helpful confirmation from the Pensions Board that surviving civil partners of deceased clergy are eligible to be considered for hardship grants if they meet the same qualifying conditions as apply to surviving spouses. This amendment was defeated with 110 votes in favour, 154 against and 15 recorded abstentions. A second amendment, proposed by Dr Philip Giddings, would have added a long list of dependent relatives, as well as civil partners, to those entitled to pensions; this was defeated on a show of hands. Reports of Wednesday’s broadcasting debate are linked here and of the ACNA debate here. On other matters there is this. On 9 February, the Church of Uganda issued a statement on the proposed Uganda legislation. The full text of this is contained in a PDF file. It has also been copied below the fold. The attached document is the official position of the Church of Uganda as endorsed by the House of Bishops of the Church of Uganda. Kindly ensure that it is represented in its entirety. 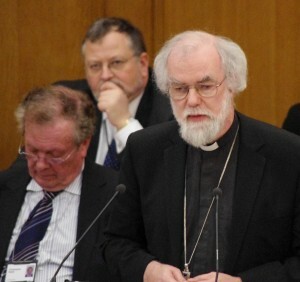 At Ekklesia there is some analysis of what Rowan Williams said on Tuesday, in Archbishop says sorry to gays but defends Church’s discrimination. In Cif: belief Savi Hensman gets more explicit: Rowan’s apology falls short. And, I wrote a piece for Cif:belief which is headlined Rowan’s speech and the equality bill. Also, Kelvin Holdsworth has written Still Shocking. (d) invite the Archbishops to report further to the Synod in 2011. The amended motion was largely the proposal of the bishop of Bristol, on behalf of the House of Bishops, but paragraph (a) was added on a proposal from the Revd Andrew Dow (diocese of Gloucester). The amended motion was carried by 309 votes in favour to 69 against, with 17 recorded abstentions. This was defeated by 166 votes in favour to 223 against with 2 recorded abstentions. During the debate there were two procedural motions, one to move to next business and one to adjourn the debate, but both were defeated. If carried either would have brought the debate to an immediate end without a vote. Summaries of Wednesday’s business at General Synod are online. The second of these will not be complete until after the close of business at 7.00 pm. We covered most of these last night, but here are a couple looking forward to some of today’s business. We link to the text of the Archbishop of Canterbury’s presidential address here. Here are some early press reports of what he said. update The Guardian has issued a correction to the above article. The online version appears to be correct. A story reported Rowan Williams’s appeal for Anglicans to show mutual tolerance over issues of gay equality and female bishops. The story also noted a statement put out by the head of the church in Uganda, Henry Orombi, supporting his country’s proposed anti-gay legislation. Contrary to our headline – Archbishop’s plea for tolerance undermined by attack on gay people at General Synod, 10 February, page 4 – the Orombi statement was issued in Kampala. The statement also insisted: “The church is a safe place for individuals to seek help and healing.” This was changed in editing to “Williams’s church”, when the Ugandan archbishop was referring to his own. Summaries of Tuesday’s business at General Synod are online. The Archbishop of Canterbury gave his presidential address to General Synod this afternoon. A press release is online, followed by the text of the speech. In addition there is Word document of the speech linked from here. The Archbishop delivering his address. Many of these articles refer to this press release from Reform Reform highlights ‘huge practical problems’ with women bishops and an attached letter sent to Synod members. A critical view of the ACNA resolution is contained in an article published on Fulcrum and due to also appear on Religious Intellligence written by the Bishop of Sherborne, Graham Kings. Read General Synod Motion concerning the Anglican Church in North America. The Bishop of Winchester, the Rt Rev Michael Scott-Joynt, said: “My name is on the original motion of Lorna Ashworth’s, and I’m happy that it was and is, but I realise that it is more practical to ask the Synod to do something that it really is in a position to do. “It is not in fact the role of the Church of England to make these kind of decisions, nor is it for Synod to make these kind of decisions. Therefore, to enable the archbishops and the bishops and others to vote positively, there needs to be an amendment like that which the Bishop of Bristol will be bringing. …it is as much about the English Church as the Church in North America. She poses precisely the sort of question that the Church of England’s leadership wants to avoid because the ACNA represents a choice which must be made between two incompatible forms of religion – historic biblical Anglicanism and that pseudo- Anglicanism being promoted by TEC and its allies which derives its energy from the spirit of the age rather than the Spirit of Christ.